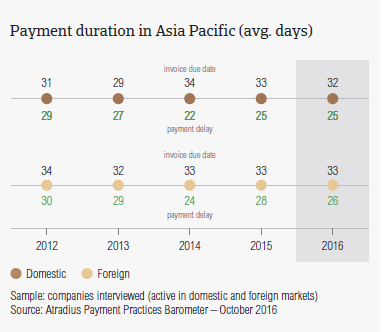 The October 2016 edition of the Atradius Payment Practices Barometer focuses on eight major economies in the Asia Pacific region (Australia, China, Hong Kong, India, Indonesia, Japan, Singapore and Taiwan). Taken together, these economies show distinctive as well as common features, which form the backdrop to this survey. Asia has remained a leader of global growth in 2016, and its frontrunner position is forecast to remain unchanged in the coming years. China’s economic growth has however slowed, due to a rebalancing towards more consumption and services. Countries (like India) and regions (like Southeast Asia) do not appear to be significantly impacted by China’s slowdown regardless of their proximity to and trade volume with the country. Other countries surveyed, in contrast, show less resilience to the challenging economic environment at global level. This is the case for Australia, where the number of insolvencies is expected to increase this year due to its vulnerability to low commodity prices. The purpose of this survey is to see how suppliers in the surveyed countries protect their businesses against the risk of payment default arising from B2B trade on credit domestically and abroad. 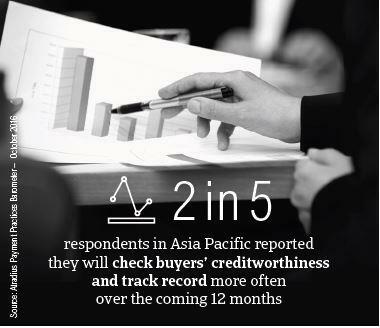 As our survey reveals, 90% of the respondents across the countries surveyed in Asia Pacific reported having offered credit terms to their B2B customers over the past year (respondents in the Americas: 87%, in Europe: 78%). This response rate (stable compared to last year) translated into an average of 46% of the overall value of B2B sales in the region being transacted on credit terms (the Americas: 43%; Europe: 41%). This percentage is stable compared to last year. On a country basis, the proportion of B2B sales transacted on credit is well below the survey average in Taiwan (39.5%) and China (38.2%), the least trade credit friendly markets in the survey. In Indonesia (43.1%) and India (45.3%) it does not differ markedly from the survey average. In Australia (49%), Hong Kong (50%), Japan (52%) and Singapore (54.5%), the most trade credit friendly country in Asia Pacific, it is above the survey average. Respondents in Asia Pacific (like those in Europe and the Americas) seem to be more likely to trade on credit in their home market than abroad. On average, 50.3% of the value of domestic and 42% of the value of export B2B sales of survey respondents were transacted on credit terms. Both percentages are stable compared to one year ago (the Americas: 47% domestic and 39% foreign; Europe: 44.3% domestic and 37.4% foreign). This pattern points to an inconsistent perception of payment default risk arising from domestic and foreign trade. However, the protection of exports from payment risk comes as no surprise for export-reliant economies such as most of those in Asia Pacific. By country, respondents in Taiwan prefer selling on credit domestically. 47.8% of the value of domestic sales was made on credit while only 31.1% of foreign sales was. A similar pattern is observed in India (52% domestic and 38.6% foreign), Japan (58% domestic and 46% foreign) and Indonesia (48% domestic and 38% foreign). China, Hong Kong and Australia show a more uniform approach to granting trade credit to domestic and export B2B buyers. With 56.6% of the value of domestic and 52.4% of the value of foreign sales made on credit, respondents in Singapore show the most uniform approach to offering credit terms in B2B trade, as well as the strongest likelihood of selling on credit to foreign customers. 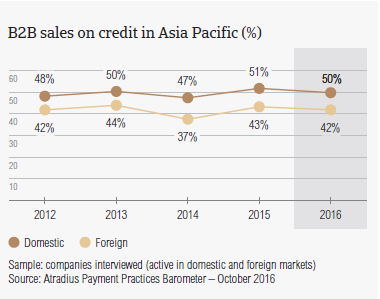 For more insights into the proportions of domestic and foreign B2B sales on credit, and their y-o-y variations at country level, please refer to the specific country report forming this edition of the Atradius Payment Practices Barometer for Asia Pacific. Nearly 90% of the survey respondents in Asia Pacific (no significant change from last year) reported having experienced late payment of invoices from their domestic and foreign B2B customers over the past year. These findings, which are consistent with observations in the Americas and in Europe, point to a widespread culture of late payment at global level. Across most of the countries in the Asia Pacific region, the percentage of respondents by country reporting late payment from B2B customers does not vary significantly compared to the survey average. The exceptions are Australia (81% of respondents reporting late payment by B2B customers) and Japan (57%). At regional level, the above mentioned statistics translated into an average of 44% of the total value of domestic B2B invoices being paid late (averages for the Americas: 47%; Europe: 42%). This percentage is stable compared to one year ago, which suggests that companies in Asia Pacific have a good grip on domestic credit management. At country level, the average total value of domestic past due invoices is the highest in India at 54.5% (no significant change from last year) and the lowest in Japan at 25% (no change from last year). In the remaining countries surveyed in the region, the domestic payment default rates range from 40.3% in Australia (49% last year) to 51% in Hong Kong (no change from last year). Despite this drop in payment default, the number of insolvencies in Australia is expected to increase this year due to the country’s vulnerability to low commodity prices. Despite being less likely to offer credit terms to foreign than to domestic customers, respondents in Asia Pacific reported a proportion of foreign invoices paid late which is equal to that recorded at domestic level (44%, stable from last year). This may indicate that businesses in Asia Pacific have less of a firm grip on export than on domestic credit management. A comparison with the proportion of foreign late payment recorded in the Americas (49.6% of total foreign B2B sales value past due) and in Europe (38.9%) evidences that businesses in Asia Pacific are less exposed to foreign payment risk than businesses in the Americas, but are notably more exposed to it than businesses in Europe. On a country basis, late payment of foreign invoices occurs most often in Australia (57.6%, 63.1% last year) and least often in Japan (24.8%, compared to 28.7% one year ago). In line with what was observed in Europe and the Americas, most of the respondents in Asia Pacific (73%) reported having granted payment terms to their B2B customers of 30 or fewer days from the invoice date (no change compared to last year). This in order to maximize value and minimize payment risk associated with B2B trade on credit. On a country basis, respondents in Australia set the shortest payment terms for B2B invoices, averaging 20 days from the invoice date (no change from last year). At the other end of the scale, Japan extends the longest payment terms in the region, averaging 44 days (47 days last year). In the remaining countries surveyed, the average payment terms range from 28 days in Indonesia (26 days last year) to 31 days in both China (37 days one year ago) and Hong Kong (36 days one year ago). Payment terms for domestic and foreign customers vary notably across countries. Local credit policies will be expanded on in the specific country reports forming this edition of the Atradius Payment Practices Barometer for Asia Pacific. Across most of the countries surveyed in Asia Pacific, domestic customers enjoy payment terms which are almost equal to those extended to foreign customers (these latter are, on average, three days longer). In India and Indonesia, domestic and foreign payment terms are equal, both average 30 days. In Japan, domestic terms (45 days) are, on average, two days longer than terms extended to foreign customers (43 days). These latter are the longest terms observed in the region. Survey findings about payment terms for domestic and foreign customers at local level will be expanded on in the specific country reports forming this edition of the Atradius Payment Practices Barometer for Asia Pacific. Domestic B2B customers of suppliers interviewed in Asia Pacific appear to settle past due invoices almost as fast as foreign customer do (on average 26 days after the due date). Domestic overdue invoices are settled the swiftest in Japan (on average 12 days after the due date), and the slowest in India (on average 36 days past due). In the other countries surveyed in Asia Pacific, payment of domestic past due invoices is made, on average, between 20 days (Australia) and 28 days (both in Hong Kong and Indonesia). Compared to one year ago, suppliers interviewed in Australia reported they received payments of past due invoices by domestic B2B customers, on average, 15 days quicker. In the other countries surveyed, payment timing of past due invoices did not change significantly. As to foreign late payment, the slowest to settle past due invoices are foreign customers of suppliers in Australia and India, who pay overdue invoices, on average, 35 days late. This time frame, has not changed for India compared to last year. In Australia, however, it is around two weeks shorter than last year. Foreign customers of Japanese suppliers pay past due invoices the swiftest (on average 12 days past due). In the other Asia Pacific countries surveyed, payment of foreign past due invoices is made, on average, between 22 days (Singapore) and 27 days (Indonesia). 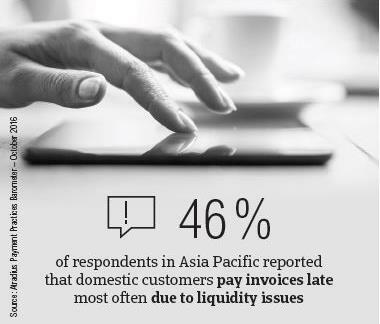 46% of the respondents in Asia Pacific (no change from last year) reported that domestic customers pay invoices late most often due to liquidity issues. These appear to stem from challenging business conditions, particularly in those countries in Asia Pacific affected by China’s slowdown and falling commodity prices. Domestic late payment in Asia Pacific occurs frequently due to the customers’ intentional delay of invoice payment for the purpose of financing their businesses, and due to the complexity of the payment procedure (27% of respondents for each reason). This latter is also the most often experienced reason for foreign late payment. At regional level, this was reported by the same percentage of respondents (around 40%) as last year, suggesting this opinion is widespread throughout the region, as well as an on-going issue affecting both export and domestic trade transactions. Foreign late payment in Asia Pacific, is also very often attributable to the inefficiencies of the banking system (cited by nearly 30% of respondents) and to reasons related to the creditworthiness of the customer (33% of respondents). It is worth noting that around 25% of respondents reported that B2B customers (domestic and foreign) most often delay invoice payment due to disputes over the quality of goods and services provided. Respondents in Taiwan and Indonesia (57% in each country) appear to be the hardest hit by late payment of domestic invoices due to customers’ liquidity issues. As seen earlier, these response rates reflect challenging economic conditions in both countries. The lowest levels of domestic late payment due to customers’ liquidity issues were experienced by respondents in Japan (30%). The perception that domestic customers do not pay invoices deliberately to finance their businesses is strongest in India (40% of respondents). The least convinced about this, in contrast, are respondents in both Taiwan and Japan (18%). The complexity of the payment procedure delays domestic invoice payment most often in Hong Kong and Indonesia (around 33% of respondents). Foreign late payment due to the complexity of the payment procedure was reported least often in Australia (25% of respondents) and most often in India (44%), Taiwan (43%) and China (42%). The inefficiencies of the banking system delay foreign invoice payment least often in Japan (21% of respondents) and most often in Indonesia (34%), India (33%) and Singapore (32%). Foreign late payment due to customers’ liquidity issues was reported most often by respondents in Singapore (46%) and least often by respondents in Australia and China (30%). As to late payment from B2B customers due to disputed invoices, this was reported most often by respondents in Taiwan (35%) in respect to domestic invoices and by respondents in India (32%) in respect to foreign invoices. Regardless of why B2B customers pay invoices late, late payment has an adverse impact on cash flow levels and may threaten the viability of the business. Due to late payment of invoices from their B2B customers, most of the respondents in Asia Pacific (34%) said that they had to take specific measures to correct cash flow, and 33% reported that they had to pay their own suppliers late. 25% had to pursue additional financing from banks, factors or others to get the necessary funds to pay their own creditors, and 22% had to request a bank overdraft extension. By country, respondents in Indonesia (46%) and India (45%) had to take specific measures to correct cash flow. In the other countries surveyed, response rates are in line with or below the survey average. The response rate related to the delay of payments to suppliers is markedly below the survey average in Japan (22%), Taiwan (19%) and Singapore (27%). In the other countries surveyed, it averages 38% and is the highest in India at 41%. The pursuit of additional financing from banks, factors or others was cited most often by respondents in India (31%) and Indonesia (29%), and the least often by respondents in Japan (12%). In the other countries surveyed, the response rate does not differ significantly from the survey average. 38% of the respondents in India requested a bank overdraft extension due to the impact of late payment from B2B customers. The local response rates for this are consistent with or below the survey averages. For more insights into this topic, please refer to the specific country reports forming this edition of the Atradius Payment Practices Barometer for Asia Pacific. Most of the respondents in Asia Pacific are of the opinion that cost containment and maintaining adequate cash flow will be the greatest challenges to the profitability of their business this year (20% of respondents). Although respondents’ opinions at overall survey level seem to be quite uniformly distributed, findings at country level highlight interesting differences. The most concerned about cost containment are respondents in Japan (36%). Taiwan and Hong Kong follow with 24% and 23% respectively. Respondents in Australia (nearly 24%, compared to 20% at survey level) seem to be more concerned about the impact of insufficient cash flow levels on the profitability of their businesses. An adverse impact on profitability caused by a likely fall in demand for their products and services concerns respondents in Singapore the most (21%, compared to a survey average of 14%) and Japan (nearly 20%). An additional reason for concern expressed by respondents in Asia Pacific is related to the DSO level (up by an average of five days from last year). Two in five respondents in Asia Pacific expect DSO to increase over the next 12 months. The most concerned about this are respondents in Singapore (72%) and India (70%). To protect business profitability from the impact of late payment by B2B customers, 42% of respondents in Asia Pacific reported they will not change their current mix of credit management tools (respondents in the Americas: 40% and in Europe: 44%). However, most of the respondents anticipate increasing the use of credit management tools that ensure a trouble free B2B sale on credit. 45% of the respondents plan on checking their customers’ creditworthiness and payment track records more often over the next 12 months. Over the same time frame, 41% of the respondents said they will increase the activities related to the monitoring of customers’ credit risk. Nearly 40% of respondents said they will either sell more on a cash basis in B2B transactions or will request secured forms of payment from their B2B customers more frequently. By country, the percentage of respondents reporting that they will check their customers’ creditworthiness more often over the next 12 months is highest in China (53%) and Indonesia (56%). Indonesia also records the highest response rate in respect to an increase in checks of the customers’ track record (60% of respondents), a more frequent monitoring of customers’ credit risk (51%), selling more often on a cash basis (61%) and more often requesting a secured form of payment (56%). 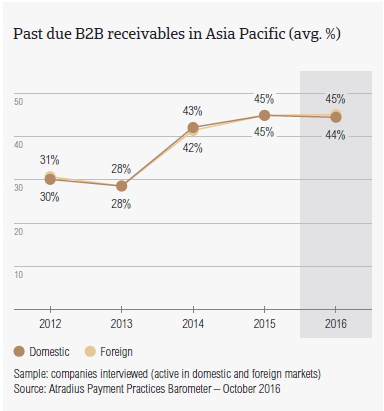 On average 2.1% (stable from last year)of the B2B receivables of respondents in Asia Pacific was written off as uncollectable (1.2% in Europe and 1.4% in the Americas). 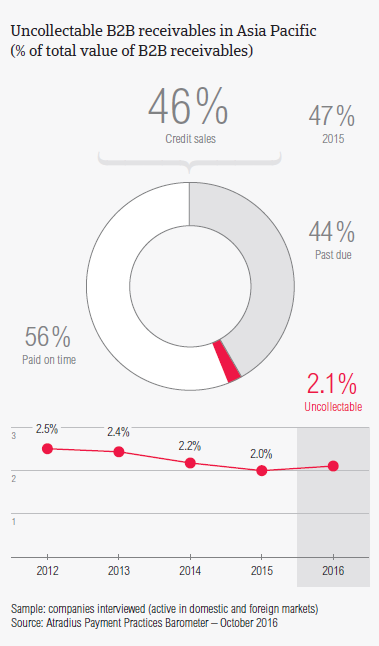 In India, the proportion of uncollectable receivables is at 2.7%; up from 2.2% last year. This reflects no improvement in collecting outstanding invoices in India this year. The proportion was slightly lower in Hong Kong (2.5%), Singapore and Indonesia (both 2.2%). In the other countries surveyed, it is notably below the survey average. Uncollectable receivables in Asia Pacific occur most often in the construction, consumer durables and electronics industries. Based on survey responses in Asia Pacific, B2B receivables were reported to be uncollectable mainly due to the customer being bankrupt or out of business (51% of respondents, compared to 54.4% last year). Australia has the highest percentage of respondents (64%) stating this reason. This reflects the difficult insolvency environment in the country, due to the vulnerability of the economy to low commodity prices. 37% of respondents reported that write-offs were due to the failure of collections attempts. This percentage is highest in Singapore (48%). 35% of the respondents in Asia Pacific reported that write-offs were due to the debt being too old. This response rate is highest in India (44%). For an average 30% of respondents, write-offs were due to their inability to locate the customer. This reason for receivables write-off was most frequently mentioned by respondents in Indonesia (40%). As mentioned earlier in this report, most of the respondents in Asia Pacific (73%) reported having offered payment terms to their B2B customers of 30 days or fewer from the invoice date (no change compared to last year). However, survey findings highlight that average payment terms may vary widely by country and by industry, differing significantly from the regional average as well. The standout survey findings in this respect are as follows. Metals – Based on survey responses, B2B customers in the metals industry in Asia Pacific are asked to pay invoices within one month of the invoice date. This is in line with the regional average across industries. In Singapore (36 Days) and India (29 days), payment terms offered to B2B customers in this industry are longer or in line with the regional average. Over the past year, at regional level, 40% of the total value of B2B invoices in this industry remained outstanding after the due date (regional average across industries: 44%). This default rate rises to 52% in India and to 48% in Singapore. At regional level, past due invoices in the metals industry are settled by B2B customers, on average, within two weeks of the due date. Observations in India and Singapore are consistent with the regional average. Late payment of invoices in this industry is most often due to liquidity constraints of the customer (45% of respondents at regional level). This response rate is 40% in India and 33% in Singapore. 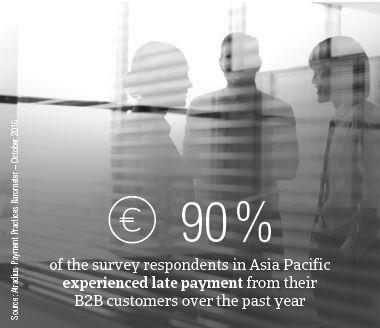 B2B customers in this industry in the Asia Pacific region delay payments most often due to the complexity of the payment procedure and due to disputed invoices (33% for each reason). In Singapore and India 44% of respondents stated payments were delayed due to invoice disputes. ICT - B2B customers in this industry are offered payment terms in line with the 30 days regional average. Payment terms offered to B2B customers by Japanese suppliers in this industry (48 days from the invoice date) are notably above the regional average. China and Taiwan follow with 40 days each. Over the past year, around 40% of the total value of B2B invoices in the ICT industry was paid late. This is slightly above the 44% average for the region. Australia was the country hardest hit by late payment of B2B invoices from B2B customers in this industry (on average, 54% of the total value of invoices in the Australian ICT industry were paid late). Past due invoices are settled by B2B customers in this industry, on average, within 26 days after the due date (equal to the average payment delay for the region). As reported by suppliers interviewed in Asia Pacific, late payment of invoices in this industry is most often due to customers’ liquidity issues (41% of respondents).By country, this occurred most often with B2B customers in the ICT sector in Indonesia (57% of respondents) and Taiwan (52%). B2B customers in this industry most often pay invoices late intentionally for the purpose of financing their businesses (30% of respondents alike). Food and beverages - Across most of the Asia Pacific region, payment terms offered to B2B customers in the food and beverages industry are in line with, or shorter than the 30 days survey average. The longest payment terms are extended to Indian customers in this industry (averaging 50 days from the invoice date). Over the past year, late payment in the food and beverages industry in Asia Pacific amounted to 38% of the total value of B2B invoices. This percentage is highest in India (56%). In this industry, overdue B2B invoices are settled, on average, within 21 days of the due date. Despite being granted the longest time to pay invoices, it takes Indian B2B customers in this industry the longest to settle overdue invoices (on average 38 days). This compares to a 26 days average payment delay for the region. Based on survey responses in Asia Pacific, B2B customers in this industry delay payment of invoices due to liquidity issues (44% of respondents). By country, this was most often the case for B2B customers in the food and beverages industry in China and India (67% of suppliers in both countries reported this). A sizeable percentage of respondents (32%) reported that B2B customers pay invoices late most often due to the non-correspondence of the goods delivered or services provided with what was agreed in the contract. Chemicals - B2B customers in the chemicals industry in Asia Pacific are offered payment terms of 40 days from the invoice date; much longer than the 30 days regional average. B2B customers in the chemicals industry in Hong Kong are extended the most relaxed payment terms (averaging twice the regional average). Over the past year, around 50% of the total value of B2B invoices in the chemicals industry in Asia Pacific were unpaid by the due date. This is above the 44% average for the region. India was the country most impacted by late payment of invoices from B2B customers in this industry. On average, 60% of the total value of invoices in the Indian chemicals industry was overdue. At regional level, B2B customers in the chemicals industry settle past due payments, on average, within one month of the due date. This time frame is the longest in India (on average, 40 days). Most of the suppliers interviewed in Asia Pacific (48%) reported that B2B customers in the chemicals industry pay invoices late most frequently due to liquidity issues. Locally, this was most often the case for B2B customers in the Australian chemicals industry (as reported by 67% of suppliers interviewed). Just over 30% of suppliers interviewed in this industry at regional level said that B2B invoices were paid late due to the formal insolvency of the customer. This was mostly the case in Indonesia (59% of respondents citing this). Construction – On average, B2B customers in the construction industry in Asia Pacific enjoy payment terms averaging 30 days or less. This with the exception of customers in Hong Kong, Taiwan and India, who are offered longer terms (averaging 40 days from the invoice date). In Singapore, payment terms in this industry average 34 days. Over the past year, 53% of the total value of B2B invoices in the construction industry in Asia Pacific was paid late (regional average across industries: 44%). Late payment of B2B invoices in this industry impacted Indian businesses the most (on average, 65% of the total value of invoices in the Indian construction industry was overdue). At regional level, past due payments in this industry are settled, on average, within one month of the due date. This time frame is twice as long in India. The majority of the suppliers interviewed in Asia Pacific (52%) reported that B2B customers in this industry pay invoices late most often due to liquidity issues. This occurred most often in Taiwan (68% of respondents). Logistics – Payment terms offered to B2B customers in the logistics industry in Asia Pacific average 33 days from the invoice date. This is in line with the average for the region. These terms are longest in Hong Kong and Taiwan (on average 44 days each). 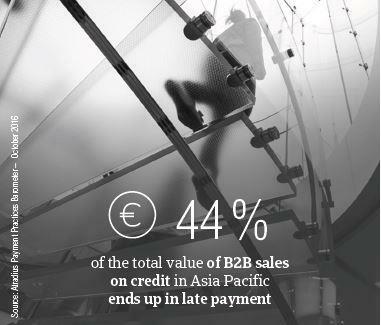 Over the past year, around 40% of the total value of B2B invoices in this industry in Asia Pacific was paid late. This compares to a 44% average for the region. On average, around 50% of the total value of invoices in the logistics industry in Hong Kong and Taiwan ended up in late payments. Past due payments in this industry are settled, on average, within three weeks of the due date. This is the case for Hong Kong, whereas in Taiwan it took B2B customers in this industry notably longer to pay overdue invoices (on average 34 days late). The majority of the suppliers interviewed in Asia Pacific (45%) reported that B2B customers in this industry pay invoices late most often due to liquidity issues. This was cited by 44% of respondents in Hong Kong and 36% in Taiwan. Machines – B2B customers in the machines industry in Asia Pacific are asked to pay invoices within one month of the due date. Over the past year, at regional level, 44% of the total value of B2B invoices in this industry was paid late. The default rate in China sits at the 44% average which is consistent with to the regional average across all industries. Past due invoices in the machines industry in Asia Pacific are settled by B2B customers, on average, within two weeks of the due date. This does not differ from what was recorded in China. Late payment of invoices in the machines industry in Asia Pacific is most often due to liquidity issues of the customer according to nearly 40% of respondents. This response rate is 37% in China. Suppliers in Asia Pacific who sell on credit to B2B customers in this industry said that they most often delay payments due to the complexity of the payment procedure, inefficiencies of the banking system and due to intentional slow payment for the purpose of financing the business (around 30% of respondents each). In China, the response rate for inefficiencies of the banking system rises to 47%, signalling this is a recurring issue experienced by Chinese suppliers in this industry. Suppliers interviewed in Asia Pacific do not show a clear-cut opinion about the trend in B2B customers’ payment practices over the next 12 months. Most of the respondents (30%) said they do not expect any change. Those expecting an improvement (17%) are almost as numerous as those anticipating a deterioration (15%). At country level, these response rates vary widely. The standout findings are as follows. Notably more respondents in the metals sector in India (26%) than in Singapore (15%) expect an improvement in B2B customers’ payment practices over the next 12 months. In the ICT sector, an improvement in B2B customers’ payment behaviour is anticipated across most of the Asia Pacific region. Australia and China have the highest percentage of respondents (two in five suppliers) expressing this opinion. Hong Kong is the only exception, with 32% of respondents expecting a deterioration in the payment behaviour in the ICT industry over the same time frame. In the food and beverages industry, significantly more respondents in Hong Kong and Taiwan (40%) than in Indonesia (14%) expect no change in B2B customers’ payment practices. Interestingly, the same percentage of respondents expecting an improvement in Indonesia expects a deterioration in Hong Kong (28%). In the chemicals sector, more respondents in Indonesia (35%) than in China (29%) expect an improvement in B2B customers’ payment practices. In contrast, 31% of the suppliers interviewed in this industry in Hong Kong and Singapore anticipate a deterioration over the next 12 months. As to the construction sector, Singapore shows the highest percentage of respondents in the region (30%) who anticipate a worsening in the payment practices of B2B customers. In the logistics industry, a high percentage of the respondents in Taiwan (46%) expect no change in B2B customers’ payment practices over the next 12 months. The same percentage expects a deterioration in Hong Kong. An improvement in B2B customers’ payment practices in the logistics industry is expected by more suppliers interviewed in Indonesia (33%) than in China (25%).